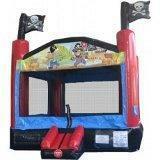 With skulls and cross bone flags adorning the front posts and a colorful pirate science welcoming children into the entrance, this jumper provides a day full of pirate fun for any gathering and will be a popular choice for your party rental... ARGH!!!!! !